Home Last news How was the MINURSO Chief trapped by the Polisario? 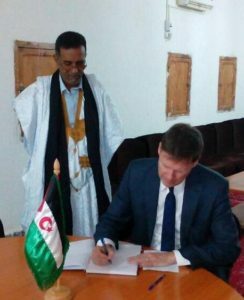 The UN Secretary-General’s special representative for the Sahara and MINURSO Chief, Colin Stewart, has been trapped by the Polisario, when he described the separatists’ late representative to the UN, Ahmed Boukhari as “ambassador”. Colin Stewart made the gaffe when writing on the condolences register following the death of Boukhari, who passed away last Tuesday in Bilbao, Spain. Canadian Stewart not only attributed the title of “ambassador” to the late Bukhari, but he also expressed his condolences on the register, in his name and on behalf of the UN and its Secretary General, Antonio Guterres. Following this blunder, the head of MINURSO was to be summoned to the Ministry of Foreign Affairs in Rabat, for clarification. Actually, Rabat deems Stewart’s wording inappropriate as the title of ambassador is normally assigned to diplomats of a universally recognized sovereign country, which is not the case of the late Bukhari. The pseudo Sahrawi republic “SADR” he represented is a puppet entity, which meets none of the criteria of a sovereign state and which has never been recognized as such by the UN. After he avoided a first trap by declining, as demanded by the Polisario, to go to Bir Lahlou in the buffer zone to present his condolences, Colin Stewart was however, ensnared by the separatists in Rabouni. He signed their register of condolences placed near a pennant of the pseudo-“SADR”. This blunder comes as Morocco is campaigning against the Polisario’s multiple provocative incursions into the buffer zones in violation of the 1991 ceasefire agreement. Encouraged by his Algerian civilian and military mentors, the Polisario is reportedly planning to transfer some of its military and administrative structures and part of the population of the Tindouf camps to one of the demilitarized zones: Tifariti, Bir Lahlou or Mhabes. The separatists would thus attempt to modify the legal framework of this region and claim possession of a “liberated territory”, a dream they have cherished for more than 40 years.